← recycled water in golden gate park? Turns out there is fascinating precedent for water recycling in Golden Gate Park! 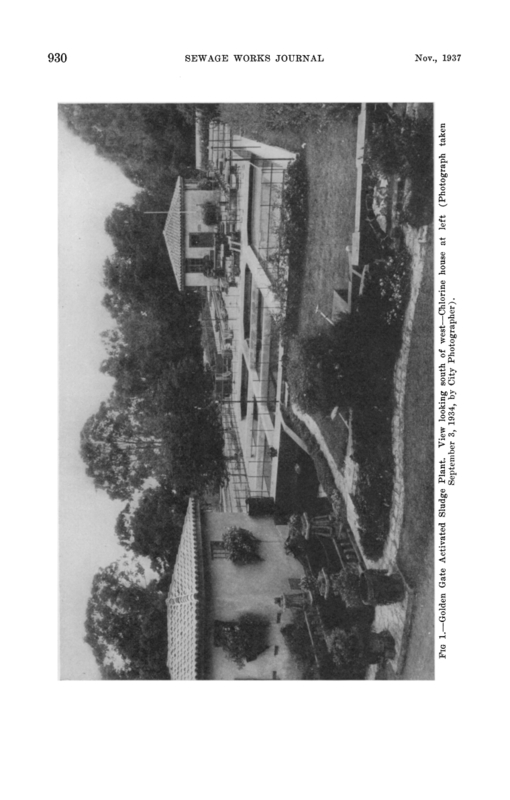 The following information is from a paper entitled: “The Beautification and Irrigation of Golden Gate Park with Activated Sludge Effluent,” written in 1937 by Charles Gilman Hyde, Professor of Sanitary Engineering at UC Berkeley, and published in Sewage Works Journal, Vol.9, No.6, Nov.1937 (pp. 929-941). The plant received raw sewage from the Lincoln Way main sewer, which collected from an area of about 2.1 square miles (the resident population of this area was estimated to be between 10,000 and 15,000 persons). It was designed for a nominal capacity of one million gallons per day; the output over a period of 18 weeks in 1933-1934 averaged 530,000 gallons per day. The paper includes tables with analyses of the content of the screened sewage and the effluent before it was chlorinated, including measurements of suspended solids, 5-day B.O.D., alkalinity, grease, chlorides, pH and temperature. There was regular testing for B.coli and the results were deemed negligible. The author concluded that the plant produced effluent that was hygienically safe. The chlorinated effluent was combined with water from Stowe Lake via “an artificial brook about two-thirds of a mile in length, with numerous cascades and waterfalls” to supply Metson Lake and the Chain of Lakes. Elk and Mallard Lakes were wholly filled with treated recycled water. Water from the plant was also used to irrigate the stadium polo fields. The paper noted that Stowe Lake and other lakes in the park supplied by ground water were already heavily infested with algae, but that the recycled water, high in nitrogen, stimulated the growth of algae even more in the lakes where it was used. This entry was posted in "lost" golden gate park, infrastructure. Bookmark the permalink. 1 Response to turning sewage sludge into gold!? Neat! I’ve been trying to figure out where exactly this was located, and it seems like it must’ve been where Elk Glen Meadow is today. It was switched off in the 80s, so it must’ve been bulldozed around that time. I wonder what infrastructure remains underground.